Brand new technology in data storage has emerged since the capacity of data has shifted from "GigaByte(GB)" to "TeraByte(TB)". U-Reach, the data equipment experts, will show a series of amazing data storage solutions with real applications at 2015 Computex, and define the concept for the next data storage solution. With the new development and various applications of hard drives, U-Reach will present complete series of HDD data backup solutions. The Server Download HDD duplicator (SDL) enables operators to download the source file directly and finish duplication under the authorization. The Rack Mount CRU HDD Duplicator (KV Series) is flexible to expand HDD/SSD Duplication with a High-End Daisy-Chain technology. The MT digital cinema series HDD duplicator can not only fit most digital cinema HDDs, but also provides an accurate data duplication with unique HDD enclosure housing for easy plug and play. The popular “Intelligent 9 Series” provides powerful quality testing and copying functions for all kinds of flash media. The advanced series includes more functions such as durability testing, double source comparison and event log reporting for professional applications. Furthermore, the newly released CD-ROM USB duplicator offers high efficiency for the mass production of CD-ROM USB drives. We will also demonstrate the standalone eMMC duplicator and the achievement of automatic integration. As the number 1 leader in the data storage industry, U-Reach’s duplication and testing equipment are approved and appreciated by many; including major storage & electronic manufacturing companies, the police, government departments as well as cinema industries. 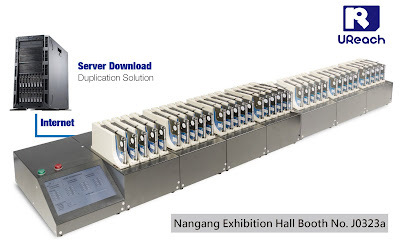 We sincerely hope to meet you at Booth No.J0323a in Nangang Exhibition Hall during 2015 Computex. For more information, please email info@ureach-inc.com or call us at 886-2-2653-5818.